Young Hero Bellamkonda Sai Sreenivas New Film Saakshyam Under Dynamic Director Sriwass Is Currently Progressing With Shooting Schedule At Rfc, Hyderabad. The Team Is Working In A Massive Set Shooting The Climax Portions In This Crucially Lengthy Schedule. Sriwaas Changed His Story, Scripting And Direction Style By Working On A Different And New Line Untouched Till Date On Indian Screen. 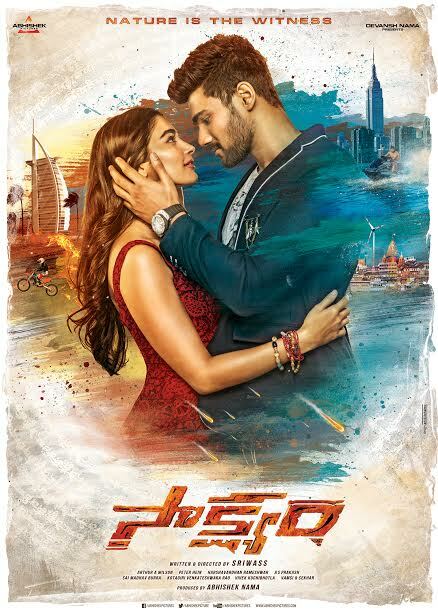 “on The Occasion Of Valentine's Day, We Take Previlige To Unveil Saakshyam First Look Of Sreenivas And Pooja Hegde In Romantically Designed Characters With The Background Visuals Depicting The Theme. Sriwaas Took Maximum Care In Make Over Of These New Looks For Sreenivas And Pooja As Their Chemistry Came Out Refreshing. Penultimate Action, Emotional Scenes From Climax Are Presently Shot On Sreenivas, Pooja, Jagapathi Babu, Rao Ramesh, Pavitra Lokesh, Jaya Prakash And Other Artist Team. After This Gigantic Schedule To Last For Few More Days, Saakshyam Team Will Leave For The Usa On One More Important Schedule. Sriwass, Sreenivas Are Taking Big Risks Leaving No Stone Unturned In Carving Saakshyam As A Land Mark Film Which Will Be Ready For Summer Release. We Are Delighted With The Brilliant Technical Output And Confident Of Bagging A Big Hit. We Are Confident About The Scripting And Directional Capabilities Of Sriwass And So Is The Rich Product In Making,” Said Producer Abhishek Nama.